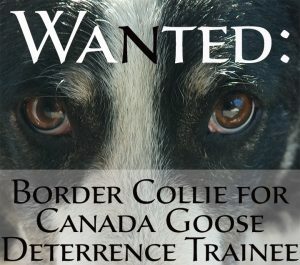 We are looking for a Canada goose deterrence dog trainee. My main working girl, Marley is 8 and beginning to have some arthritis in a paw. So we are in need of a helper, to someday take over. 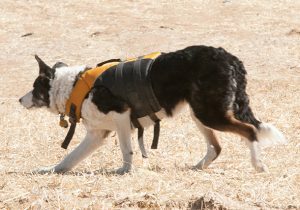 Do you know of any likely Border Collies needing a home with a vocation? 1. Female, 1 to 2 years (maybe 3). Darby “stalking” some Canada geese. 4. We need to have a strong “eye.” We extensively used Darby’s “walk up” with an intense eye to convince the geese they are being hunted. The intense dog who has trouble releasing their sheep by looking away could actually work well for us. However, she can’t be so sticky she won’t actually chase after the geese. 5. Flanking and gathering is not really needed, actually, the girl who insists on hauling freight straight up the middle is fine with us! The occasional “flanking” around a pond can be learned. 6. Willing to swim would be nice. 7. Willing to fetch balls, disk or the like is ideal for exercise during the off season and quiet times. We are also a flyball family. It would be nice, but not a deal breaker. 9. This is city life, with some exposure to “fan club” type people. While I don’t want a social butterfly, a dog needs to be fairly comfortable about people. I do try to maintain the working dog bubble around my dogs, but there is always the clueless showing up now and then. 10. We spend lots of time in the car, from one client to the next, a dog can’t be getting car sick. 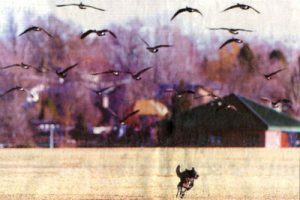 The Border Collie with strong gathering instincts will not like this job, since the geese are impossible to gather. 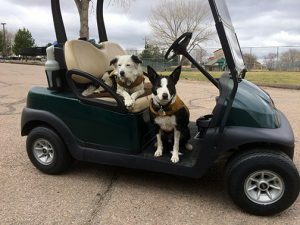 Marley & Wick on a golf cart. Which brings me to the difficult part; a dog will need to have a couple of exposures to geese to see if she will take to this job, and keep doing it. My Skye tried it twice, and upon the third try, she pretty much told me where I could take my hair-brained idea. She never would even look at geese again—sheep yes, goats yes, geese no. So somehow, I need to arrange opportunity to try a dog on geese. I can either meet with you in the Denver area, or talk you thru testing on geese in your area. To get to try geese, a hopeful needs to have a solid recall for when the geese fly off! The temptation is to follow after the birds!